Sapphire Farms specializes in the black Arabian horse and is the home of some truly outstanding black horses. 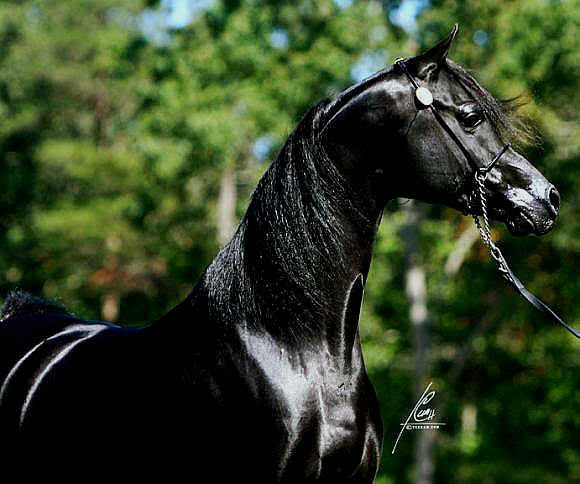 We have focused on the black color in the Arabian horse since 2000...but we will not compromise on quality and beauty just for color. The black stallions THEE ONYX and OM EL NAJEEB DREAM call our small farm home. Tragically, we lost our beloved Thee Onyx in 2016. Thankfully we still have two gorgeous Onyx daughters that are loved and appreciated every day. We adhere to the belief that a breeder should have quality, not quantity. Our small farm has sold horses in the continental United States and we have had our horses exported to Europe and the Middle East. Sapphire Farms bred horses have gone on to become and produce Halter and Performance Champions. We strive to have both halter and performance prospects to offer in the stunning black coat color -- just let us know what you might be looking for. If we don't have what you're looking for we may be able to help you find it. Broodmares and bred mares are occasionally available. Be sure to check out our Sales page as we may just have your next Champion...in black! Mary Kinsey and Sue Wells are sisters who invite you to enjoy the selection of beautiful Arabian horses we have to offer. Most are the elusive black color and all are just gorgeous! Sapphire Farms is located in south central Pennsylvania. We will be happy to help you arrange the domestic and international transport for horses purchased from us. Sapphire Farms - home to some of the most beautiful black Arabian horses in the world! A new black filly has arrived on April 26, 2017! We now offer Equine, Farm and Pet Photography...check out our Photography page. See original black Arabian horse Artwork inspired by our horses here.